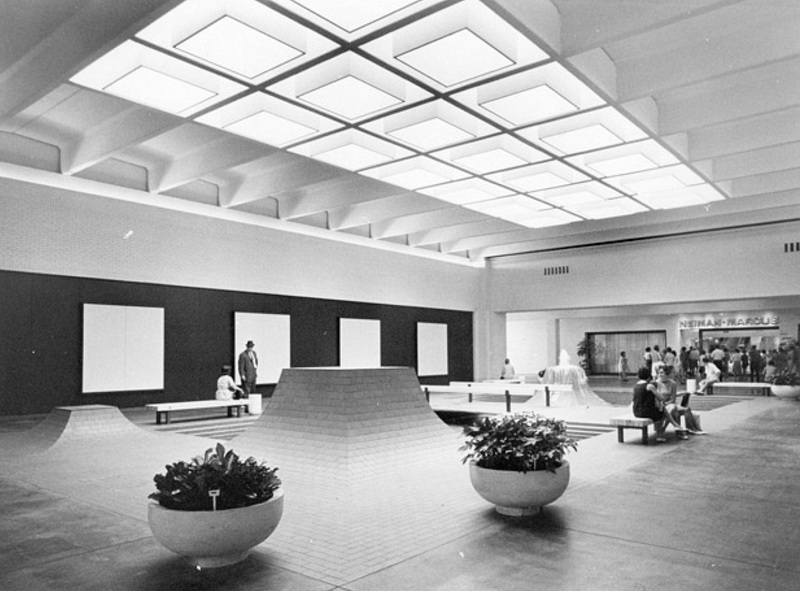 NorthPark Center — the only mall I’ve ever enjoyed being in — turned 50 last year. Developed by the legendary Raymond Nasher, it opened in August of 1965 on 90-something acres of old Caruth farmland. Sleek, cool, uncluttered. There was art! There were ducks! There were naughty playing cards and black light posters in Spencer’s! There was even a dime store! I spent a lot of time there as a kid in the ’70s, which is probably why I feel completely lost in the expanded, ultra-upscale version of today. I used to know where EVERYTHING was. Now? Since its recent “augmentation,” it doesn’t feel like “my” mall anymore. Now, for me, it’s just another upscale Dallas mall (albeit in an unusually appealing building and in still-sleek, aesthetically pleasing surroundings). But then I’m a person who is generally not a fan of shopping and feels anxious in shopping malls, so I’m clearly in the minority amongst Dallas women. Today’s NorthPark is still going strong and is as popular as ever (if not moreso), but I will always prefer the NorthPark of my childhood — it’s the only shopping mall I’ve ever felt completely at home in. At the top, the Melody Shop — where I bought my first records. People were always in there playing the organs. Neiman’s was there, too, of course — at the swankier end of the mall. N-M was intimidating. There weren’t a lot of black light posters and Keds in there. Which is why I spent most of my time in the stretch between the Melody Shop and Penney’s. But the one thing that absolutely everyone who ever spent any time there as a kid remembers most? 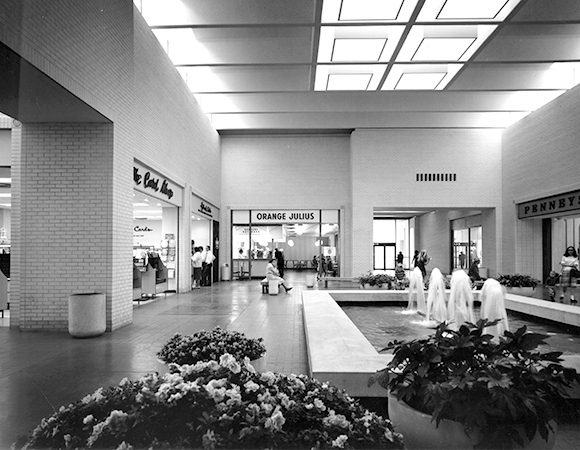 Come to think of it, what I remember most about the NorthPark of my very early childhood is how smooth and cool-to-the-touch everything was — especially for children like me who were climbing all over everything: the tiles of those “slides,” the concrete of the fountains and planters, the floors, and those white bricks, inside and out. Everything was so smooooth. Happy belated birthday, NorthPark! 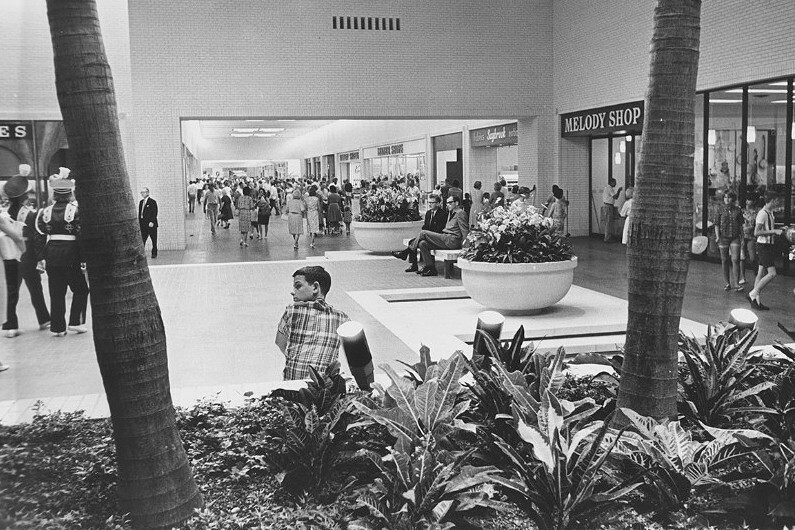 Most of these photos are from 1965, and most are from the history page of the NorthPark Center website, here. Their entertaining NorthPark50 blog is here. More on the history of NorthPark at Wikipedia, here. A 15-minute 50th anniversary video by The Dallas Morning News is on YouTube, here. One of the first mentions of the future super-mall (and its 99-year lease) was in the March 5, 1961 edition of The Dallas Morning News in the article “Big Shop Center Slated in Dallas” by Rudy Rochelle. See a cool color photo of the brand new mall here. 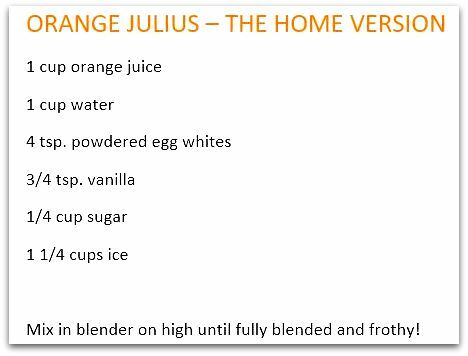 Want to make your own Orange Julius? Here’s a good recipe. The secret ingredient is powdered egg whites, available at Whole Foods and most larger grocery stores. The added sugar is important, but you might not want to use a whole quarter-cup. UPDATE: The powdered egg whites I used to buy at my local Tom Thumb — “Just Whites” by Deb El — is no longer available. I tried several grocery stores today and couldn’t find powdered egg whites anywhere. They may be available in health food or vitamin/supplement stores. I just ordered some online. If you don’t mind using egg whites out of the shell, substitute 2 egg whites for the powdered in the recipe below. The thing about the old NorthPark, and what really stood out to me as a kid, was how quiet it was inside. You could hear a few stray voices here and there, but it was for the most part, quiet and peaceful–definitely not like other malls. I was going to mention how generally calm and quiet it was, but I was wondering if I was just making that up! Love North Park. We always try to drop in when visiting Dallas. I grew up in San Antonio, and remember visiting my cousins here in Dallas sometime in the summer of 1965. My cousin Patty told us all that we had to visit the very newest shopping center in town, unlike anything we had ever seen before–I know now that it was NorthPark! I wish I could recall that first visit more clearly, but I do remember that we were all most impressed! I loved Northpark when it opened..very exciting time..first enclosed mall. I think there was only one other in Wynwood Village in Oak Cliff and it was open. My friend’s nephew owned the Orange Julius and a friend and his business partner owned the Melody Shop. It’s still my favorite mall…and closest. I can’t walk it anymore and can’t always find all the stores right away..but it’s my mall. Congratulations, North Park, for providing the best shopping in Dallas for 51 years. What is now in the spot where orange Julius was? Just looking, I think the marching band members are standing in front of what is now Banana Republic. Let me know what you think. Love you post and the cool pics!! Thanks, Robin! I actually haven’t been to NorthPark for quite a while, so I’m not sure what’s there now. The Orange Julius used to be right outside the mall entrance to Penney’s — now Macy’s. I worked at Tom Thumb during my time at NDHS. I saved my money so Glenn Grimes and I could go to North Park Mall. GREAT FUN!! The fountains were so cool! And the decorations at Christmas were always so great.